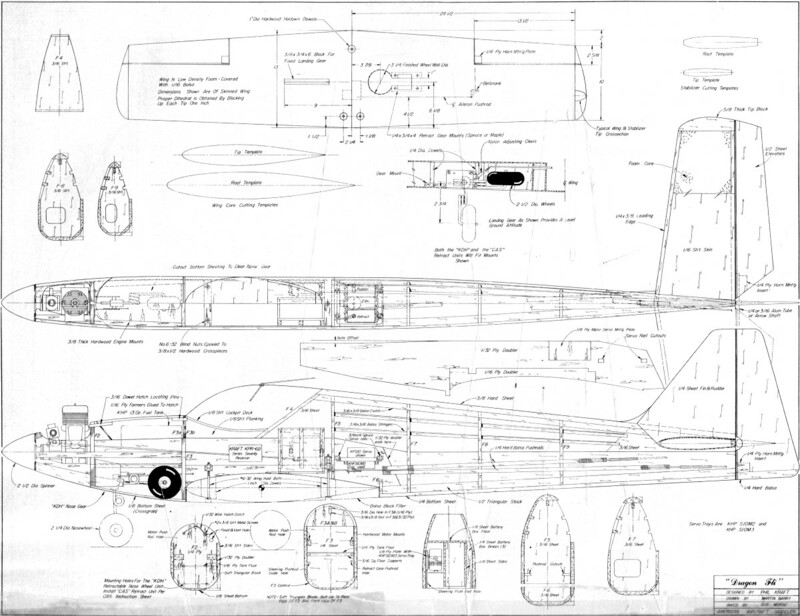 Website visitor Steve S. asked for a scan of Phil Kraft's Dragon-Fli pattern plane. 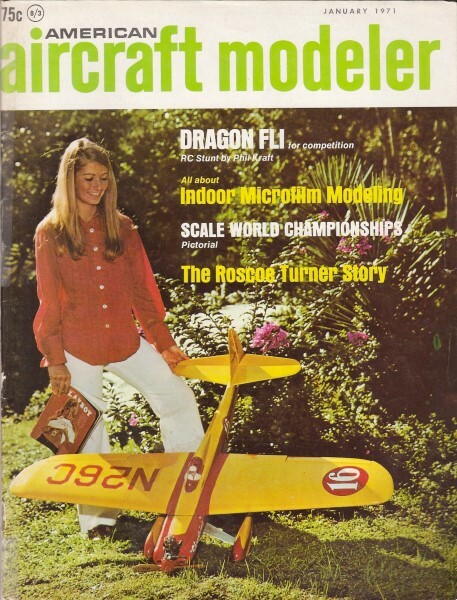 It appeared in the January 1971 American Aircraft Modeler on page 19. Precision / advanced aerobatics airplanes have undergone a significant transmogrification from somewhat boxy outlines with only slightly larger than normal control surfaces and retractable, tricycle gear, to curvaceous tail draggers with fixed gear. Programmable radio with multiple throw rates and control mixing have permitted a lot of freedom in the configuration of the entire aircraft. All-out competition stunt ship by Phil Kraft ­ based on years of experience and testing. Retracts recommended for best performance. PATTERN FLYING TODAY is perhaps 97 per cent pilot and three per cent aircraft design. However, the world's top fliers are so close in ability that the airplane's three per cent can be decisive. There is no question that in the last two years a trend has developed toward heavier, faster competition stunt models. After all, a stunt performance is primarily intended to take maximum advantage of the human factor in judging. At contests, fliers often comment that "so and so" put in a lousy flight, but his spectacular performance biased the judges. Author holds latest in his Fli series. It is sensitive, precise, fast and graceful. Editor's note: Dragon FIi's speed and airfoils need only small control surface movements, proper balance. It can land quite slowly, too. In my opinion, it is not possible to differentiate between the spectacular performance and a properly performed sequence of maneuvers. Fliers are trying to paint a picture and to create an effect. Thus, I have come to believe that the high-speed spectacular pattern with large graceful maneuvers will be most effective in gaining maximum points. This new line of thinking has been a complete turnabout. The Kwik-Fli series of designs was in exact opposition to the current trend. They were slower flying, lightweight, rather unspectacular designs. The maneuvers were compact and had to be tightly controlled to be effective. The Kwik-Fli emphasized reliability and consistency above other factors. However, it was designed in an era when powerful contest engines which also were reliable just weren't available. Today, there are several extremely powerful engines with great reliability as well. Therefore, the design trend has been made possible almost entirely by the availability of superior engines. The Dragon Fli design is a development of the Slik-Fli-type fuselage, combined with a newer wing design. Three different airfoils were tried during testing before settling on a 15 per cent section with a maximum camber at about 40 per cent. This low aspect ratio was selected primarily for ease of transportation. It does not appear to have any deficiencies, and may have advantages as far as flight performance is concerned. The deep fuselage of the Dragon Fli contributes to stability, particularly in rough air. Like anything else, it also has disadvantages, such as in taxiing in strong winds. The plans show retract gear, and there is no question but what this is an absolute necessity for contest flying today. Fliers used to think the effect of retract gear was primarily psychological. However after having flown an airplane with retract gear, I don't think I would enjoy going back to the fixed gear model again, despite the headaches with the less than satisfactory retract gear units that are currently available. To sum up, the Dragon Fli is a sound design capable of competition performance. 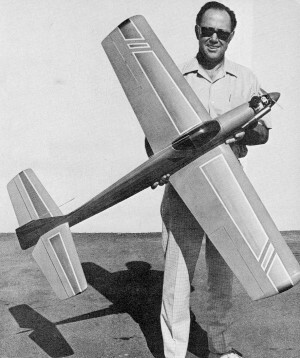 Jim Edwards flew one to second place in this year's Nationals, and two others placed in the top 20 qualifiers.